“Bloody Tarawa” earned its reputation as the U.S. Marines suffered one of the most devastating battles of the Pacific war. 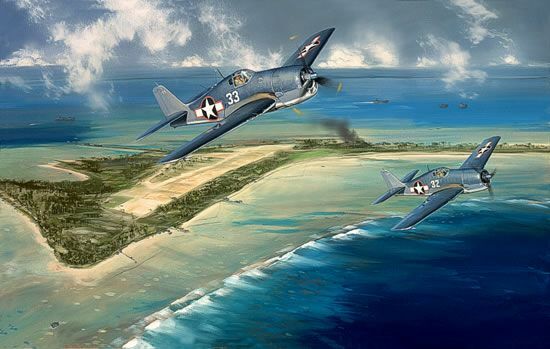 On 30 November 1943, these Grumman F6F-3 Hellcats from Air Group 16, Task Force 50 Carrier Force skirt Betio Island, part of the Tarawa Atoll in the Gilberts during Operation Galvanic. Naval bombardment forces had opened fire on the atoll intending to flatten defensive positions so that ground troops could take the island. The tragic lesson learned was that the bombardment (naval AND aerial) was not enough, in itself.